Explore Scientific has released its new iEXOS-100 which offers a complete computerized Wi-Fi or wired GOTO Equatorial Tracker with integrated PMC-Eight electronics suitable for attaching small telescopes or DSLR cameras attached to a standard “Vixen Style” dovetail plate. It can be used with the Explore Scientific’s free ExploreStars App for Tablets (Windows, Android, iOS), or with the free ASCOM Standards Compliant POTH Client from Explore Scientific (either wired or wireless) to work with virtually any sky software that supports ASCOM. 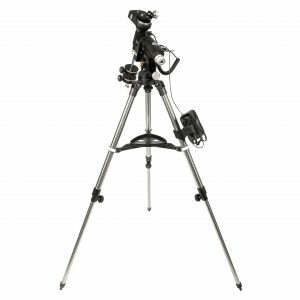 The iEXOS-100 utilizes a proven German equatorial mount design and Explore Scientific’s PMC-Eight precision motion control system to navigate the night sky and track objects as they journey across it. The eight CPUs operate independently of one another to focus on defined functions. This delegation of tasks among the processors results in a system that offers superior responsiveness, efficiency, reliability and fast timing intervals for seamless images and accurate tracking. The iEXOS-100 has locking clutches that will let you quickly reposition your telescope from one side to the other and an altitude knob for smooth height adjustments. The mount base includes a small polar alignment tunnel that allows users to roughly align their observing setup with Polaris. It also has a simple bubble level that comes in handy when stabilizing your tripod. Other features include a bracket for holding the battery pack, which powers the PMC-Eight system through 8 C batteries; two 1 kg counterweights for balancing; and glow-in-the-dark markers on certain points of the mount and tripod so you can stay oriented with your setup at night. The mount is designed to hold up to 19 lbs of astronomical equipment.